With an ever increasing emphasis on evaluation within marketing campaigns 'dark social' looks like an area ripe for development. As ever when I use the word 'evaluation' it is important to drop in the importance of creativity. Measurement can stifle risk taking and creativity. Dark social is an increasingly important source of referral traffic. 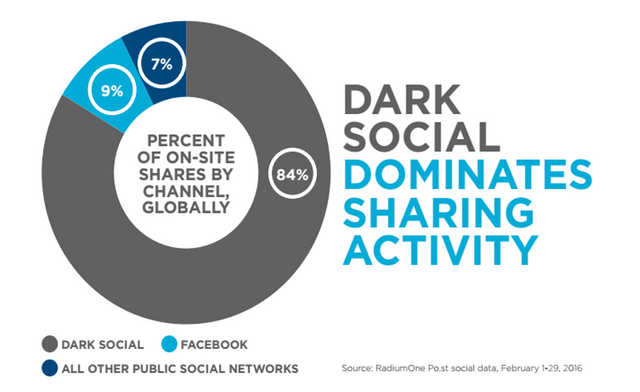 According to new research from RadiumOne, dark social dominates how people share and interact with online content on smartphones. Its research found that dark social channels account for 77% of shared content via mobile phones, with just 23% coming from public social networks. And when it comes to engaging with shared content, 80% of clicks come from dark social sources, with smartphones accounting for 64% of that total.